Lee Min-jung, most well-known for her recent role playing Lee Min-ho’s annoying (but endearing) fiancée in Boys Before Flowers, is getting her first leading role. It’ll be in the new SBS weekend drama Smile (more literally, Smile, You [그대, 웃어요], which is a working title). At first glance, the story seems somewhat reminiscent of early descriptions for My Fair Lady — Lee Min-jung’s character is the immature second daughter in a chaebol family. However, one key difference is that this chaebol family is on the decline (while Yoon Eun-hye’s is very much still rolling in the riches). After they are thrown into sudden ruin, they are taken in by the family of their longtime chauffeur (played by Choi Bool-am, the grand chef in SBS’s Gourmet). One can only imagine all the sorts of shenanigans that arise. I think I’m hooked already! The setup has got a lot of familiar elements, but employs just enough of a twist to make me want to see how all this plays out. This makes sense given the PD-writer team of Lee Tae-gon and Moon Hee-jung, who showed their ability to add refreshing touches to well-worn, familiar stories with last year’s updated Cinderella tale The Last Scandal of My Life, which was zippy fun. 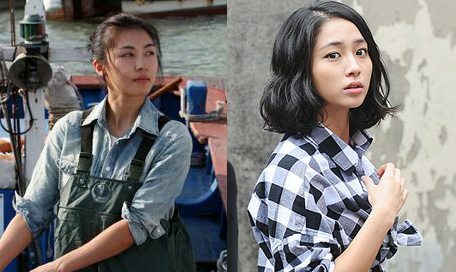 On top of all that, Lee Min-jung is bright, charming, and talented. Sign me up. The drama which will follow the just-premiered Style and air in October. According to a representative with SBS’s drama department, Lee Min-jung’s casting is “almost finalized,” which means the documents have to be processed but the casting is pretty much a go. ack I was just about to post for her upcoming drama dramaluv3r101 haha! Most definitely sign me up too! I agree some of the themes seems similar but I trust the PD/Writer team will do a great job just like The Last Scandal of My Life. She's probably my favorite actress after seeing her work and growth from her earliest media to the most recent. So glad that she's finally getting a lead role in a drama! I don't think I've seen quite a unique personality like hers in any of the many dramas I've watched over the years. Although in interviews and elsewhere she said her performance wasn't that great in Boys Over Flowers I felt her acting definitely added a ton of value to the drama. I think I'd call this her true breakout series since her roles in other drama such as Who Are You and Kimcheed Radish Cubes while strong, didn't cause quite the outbreak of new fans and her own career success. OMG, I just found out she have a new serie and she is the LEAD!! ahh, I wonder who is the male lead, I can't wait to see her again. I love her in BOF, lol I actually don't kill me fans, but wanted min ho and her end up. okay enough of that, but I hope to hear more news about Smile, or Smile, You soon! SBS가 주말극 '스타일'의 후속작으로 '그대, 웃어요'(가제)를 편성, 주말극 왕좌를 지키겠다는 포부다. SBS 드라마국 관계자는 최근 스포츠조선과의 인터뷰에서 "'그대, 웃어요'가 '스타일'의 후속작으로 편성이 확정됐다"며 "'유리의 성' '가문의 영광' '찬란한 유산' 등 주말 드라마 시장에서 SBS가 유독 강세를 보여 왔는데, '그대, 웃어요' 역시 큰 사랑을 받을 수 있을 것으로 기대하고 있다"고 밝혔다. '그대, 웃어요'는 철없는 로얄 패밀리가 쫄딱 망한 후 은퇴한 자신의 운전기사 집에 얹혀살며 겪게 되는 수난기와 그 과정을 통해 절대 융화될 수 없을 것 같던 두 가족이 마침내 한 가족으로 뭉치게 되는 내용을 다루고 있다. 현재까지 주연 배우로는 '이민정 지현우 김민선' 등이 거론되고 있다. 이와 관련해 SBS 측은 "세 배우가 거론되고 있는 것은 사실이지만 아직 확정되진 않았다"며 "다만 최불암 선생님 등 베테랑 연기자들의 캐스팅은 대부분 마쳤다"고 전했다. 로얄 패밀리의 둘째 딸로, 무식하게 대범하고 어디로 튈지 모르는 '지뢰녀' 서정인 역은 '꽃보다 남자'를 통해 스타 반열에 오른 이민정이 거론되고 있다. 김민선이 거론되고 있는 정인의 언니 서정경은 로얄 패밀리의 첫째 딸로, 차가운 냉정 속에 뜨거운 열정을 품고 사는 '얼음녀'. 프로의식이 강한 종합병원 레지던트 2년차이다. 이들 사이에서 삼각관계가 되는 강현수 역에는 지현우가 거론되고 있다. 강현수는 카센터 아들로, 카리스마 속에 소심함을 꽉 채운 '만두남'이다. 9월 말에서 10월 초 방영 예정인 '그대, 웃어요'는 '인어 아가씨' '왕꽃 선녀님' '하늘이시여'로 유명한 임성한 작가의 '손짓'(MBC-9월 5일 첫 방송)과 맞대결을 펼친다. 밝고 유쾌함을 지향하는 가족 드라마 '손짓'은 이태곤 소이현 한혜숙 박근형 등이 캐스팅된 상태. SBS 측은 "임성한 작가의 '손짓'을 견제하기 위해 '그대, 웃어요'에 심혈을 기울이고 있다"며 "'손짓'의 행보에 따라 캐스팅에서 스토리까지 모두 유동적이다"고 귀띔했다. 그는 올해초 방송가에 '꽃미남 열풍'을 일으켰던 '꽃보다 남자'에서 '최고의 꽃미남' 이민호를 찾아냈다. 또 'SS501'의 김현중 김범 김준 이민정 등을 발굴했고, 이들을 스타대열에 올려놓았다. 이전에도 마찬가지. 에이트픽스 시절 제작했던 '궁'에서는 '미완의 대기' 주지훈을 발굴했고 많은 사람들의 만류에도 불구 베이비복스출신 윤은혜를 캐스팅해 오늘날의 '윤은혜'를 만들어 냈다. 이 때문에 송병준 대표의 캐스팅 비법에 많은 사람들의 관심이 쏠리고 있다. 최근 송대표는 아시아경제와의 인터뷰에서 캐스팅 비법으로 '작품과 어울리는 캐릭터'와 '연기력보다는 가능성'을 꼽았다. 송대표가 펼치는 드라마들 대부분이 원작이 있기 때문에 등장 인물의 캐릭터와 흡사한 연기자를 '찜'하는 것이 드라마의 리얼리티 확보에 첫번째 조건이라는 것. 이천희-이민정이 남매가 된다? 최근 이천희, 이민정, 이규한 등이 드라마 '스타일'의 후속작 SBS 주말특별기획 드라마 '그대 웃어요'에 캐스팅돼 눈길을 끌고 있다. 드라마 '그대 웃어요'는 자수성가한 아버지 덕에 잘 살아온 한 재벌 집안이 갑작스럽게 몰락한 후 운전기사의 집에 온 가족이 얹혀살게 되면서 벌어지는 에피소드를 그린 가족 드라마다. 여주인공으로는 올해 최고의 화제작 '꽃보다 남자'에서 구준표 약혼녀 '하재경' 역으로 출연해 얼굴을 알린 이민정이 발탁됐다. 극 중 이민정은 철없고 매사 자기 중심적인 몰락한 재벌 집안의 둘째 딸로 서정인 역으로 출연, 운전기사의 손자와 로맨스를 펼친다. 서정인 역은 막무가내이긴 하지만 당차고 정이 많은 캐릭터다. 현재 이민정은 소속사와 SBS 드라마국 간의 서류상의 절차만 남은 것으로 알려졌다. 또 SBS 간판 예능프로그램 '패밀리가 떴다'에서 활약했던 이천희도 '그대 웃어요'를 통해 안방극장으로 컴백한다. 이천희는 이민정의 오빠인 재벌집 장남 역을 맡아 유학생활을 마치고 돌아와 외국인 여자친구와 결혼하겠다며 속을 태우지만 결국 개과천선해 집안을 일으키게 된다. 이천희는 '패밀리가 떴다'에서 보여준 '천데렐라' 이미지를 그대로 보여 줄 예정이라고. 이로써 이천희는 KBS 드라마 '대왕세종'에서 장영실을 연기한 데 이어 약 1년 만에 드라마로 컴백, 예능 프로그램인 '패밀리가 떴다' 이후 약 4개월 만에 시청자를 만난다. 관련기사 20개 <<AD 이민정의 전 약혼자로는 배우 이규한이 캐스팅됐다. 극 중 이규한은 결혼을 약속했던 서정인의 집안이 갑작스럽게 몰락하면서 부모의 반대와 우유부단한 성격 탓에 그녀와 헤어졌지만, 결국은 그녀를 잊지 못하고 서정인의 새로운 연애를 사사건건 방해하는 얄미운 남자 이한세 역을 맡았다. 이한세는 욕심도 많고 질투도 많지만 서정인에 대한 마음만큼은 순수한 인물로, 마음속에는 전 약혼자를 품고 있지만 정작 겉으로는 시기 어린 행동만을 보여주는 철없는 캐릭터다. 이 밖에도 '그대 웃어요'에는 슈퍼주니어의 김희철, 최불암 등이 출연을 확정한 것으로 알려졌다. 한편, SBS 주말특별기획 드라마 '그대 웃어요'는 김혜수, 류시원, 이지아, 이용우 주연의 '스타일' 후속으로 10월 방송예정이다. Wow thanks for the info. looking forward to seeing Min Jung in the mv. Is there any new on Min Jung's serie? I really hope to hear about it soon! Got some new pics on Min Jung. Something about her and Ha Ji Won? [아시아경제신문 황용희 기자]'1천만 관객돌파'를 앞둔 영화 '해운대'에서 애절한 눈물연기로 열연한 하지원에 대해 '꽃남' 이민정이 '눈물연기' 도전장을 냈다. 이민정은 신인그룹 디셈버 뮤직비디오에서 감성어린 눈물연기 열연을 펼쳤다. 영화에 이어 음반에서도 여자 연기자들의 '눈물 연기'가 대중들의 마음을 흔들 예정이다. 1천만 관객 돌파를 목전에 둔 영화 '해운대'의 여자주인공 하지원은 애절한 눈물연기로 또 다시 한번 '눈물의 여왕'이라는 칭호를 받았다. 부산 사투리를 앞세운 그의 눈물연기는 '해운대'의 흥행몰이에 결정적인 역할을 했다는 것 평가. 우 이민정이다. 그는 최근 신현준 김승우가 음반제작자로 참여한 신인그룹 '디셈버' 뮤직비디오에서 여주인공으로 출연, 또 다른 차원의 눈물연기를 선보였다. 이민정은 '디셈버' 뮤직비디오에서 안타까움과 애증으로 점철된 빼어난 눈물연기를 선보여 '뮤직비디오'계의 '눈물 여왕'으로 이름을 올렸다. 뮤직비디오의 눈물여왕 계보에는 이미연-하지원-김옥빈 등이 올라있다. 이미연 드라마 명성황후 OST인 컨필레이션 '연가' 에서 한과 그리움이 뒤섞인 눈물연기를 선보인 바 있고, 하지원은 가수 KCM의 '흑백사진'에서 고마움과 후회의 연기로, 또 김옥빈은 지아의 노래 '울끄러미'에서 설레임과 갈등의 연기로 각각 엘리지의 여왕 대열에 오른바 있다. 이번 이민정의 연기를 지켜본 방송 관계자들은 "디셈버 뮤직비디오에서 이민정의 한층 성숙된 연기력을 볼 수 있었다"며 "이민정의 눈물연기는 이미연-하지원-김옥빈으로 이어지는 뮤직비디오 눈물의 여왕계보를 잇기에 충분한 명품 눈물이었다" 고 말했다. '디셈버'는 영화배우 신현준, 김승우의 음반 제작자 참여와 함께, 국내 최대의 기업 SK텔레콤(로엔엔터테인먼트)와 CJ(엠넷미디어)의 막강한 제작 및 마케팅 투자 지원으로 큰 화제가 되고 있다. 막강한 쇼비즈니스 라인업을 등에 업은 '디셈버' 뮤직비디오가 이민정의 눈물로 큰 화제를 몰아올 전망이다. 드라마 ‘꽃보다 남자’에서 하재경 역으로 인기가 급상승한 이민정도 충무로 관계자들의 사랑을 받고 있다. 이민정은 올가을 ‘백야행-하얀 어둠 속으로’와 ‘펜트 하우스 코끼리’를 선보인다. 조연이지만 관객들의 눈길을 끌 만한 배역을 맡았다. 세련되면서 여성적인 분위기와 탄탄한 연기력이 최대 장점이다. 충무로 관계자들은 이런 세대교체 움직임에 대해 “톱스타들이 작품보다 CF 출연에만 목을 맨 나머지 이미지를 너무 소비해 새얼굴들을 찾게 된다”며 “이제 배우의 티켓 파워만으로 승부할 수 없는 시대이기에 톱스타들이 거품을 빼지 않는 한 가능성 높은 신인들을 찾는 움직임이 더 거세질 것”이라고 전했다. Nice, I did a VERY rough translation and it's talking about something like the 'queen' of tears between these two actresses. Ha Ji Won since she's in in the tremendously popular movie Haeundae which has recently joined the club of few Korean movies to surpass 10 million box office sales is regarded as one of the top actresses to bring tears to an audience. But with the megadrama BoF Lee Min Jung is also a contender in that category I think is what the article says. With LMJ's appearance in the music video I think it's saying that people in the drama industry are watching her performance and seeing if her acting ability is growing (I've watched her old work and although I wouldn't say it's bad, I think her performance in BoF was essential to the success of the drama and a huge improvement to her earlier work ). LOl I think Min Jung's character was perfect for GJP, they should have end up I thought, she loved him so much and they are so a like. Lee Min Jung, best known for her role as Gu Jun Pyo’s fiancée in popular drama "Boys Before Flowers", was originally the female lead in G-Dragon’s MV for his first solo album. However, she gave up the opportunity and instead, starred in newbie group December’s MV. As G-Dragon’s "Hearbreaker" album is enjoying record-breaking sales and extreme popularity, netizens were naturally curious about the reason behind Lee Min Jung’s decision. In reply, December’s agency CS Happy Entertainment said that ‘Before Lee Min Jung became popular, she starred in Zia’s MV ‘Violin’. Hence, she was grateful for the opportunity we had given her then and hence decides to star in December’s MV.’ It was then said that the schedules would clash and that she would be unable to take part in G-Dragon’s MV. Got more news and pics of her. Is there more news on SMILE? gosh I really want to know how the serie is going and if she have other projects? lol got to bring it up but what do you think if Min Jun and Min Ho are paired up again? [티브이데일리=김현정 기자] 탤런트 이민정의 맑고 투명한 피부가 네티즌들 사이에 화제를 모으고 있다. 이민정은 최근 자신의 미니 홈페이지를 통해 화장을 하지 않은 얼굴과 수수한 옷차림의 사진을 공개해 눈길을 끌었다. 맑고 깨끗한 피부가 파란 티셔츠와 제법 잘 어울리는 모습이다. 사진을 본 팬들은 "28살 나이가 의심스러울 정도로 어려보인다" "최강희만큼 동안인 것 같다" "투명피부의 비결이 무엇일지 궁금하다"며 이민정의 쌩얼을 부러워하고 있다. 이민정은 KBS 2TV 드라마 '꽃보다 남자'에 등장한 후 각종 CF에 출연하며 단숨에 스타의 자리에 올라섰다. 그녀는 현재 차기작을 고르기 위해 잠시 휴식중인 것으로 알려졌다. Ahhh went on a mini vacation so haven't been really caught up but.. I did find some more news on Smile.. looks like they finished casting! The new SBS drama Smile [or Smile, You aka 그대 웃어요] has found its leading man to play opposite Lee Min-jung (Boys Before Flowers, Who Are You) in her first leading role. Although the cast already includes Family Outing’s “Chunderella” Lee Chun-hee and Que Sera Sera’s Lee Kyu-han, neither of them will be the main love interest. That role goes to Jung Kyung-ho of Ja Myung Go, You’re Far Away, and Time of Dog and Wolf. In the story, Lee Min-jung is the daughter in a rich chaebol household, while Lee Chun-hee is her immature older brother. When her family meets with financial ruin, she’s dumped by her former fiancé (Lee Kyu-han) until he decides he wants her back. Meanwhile, she and her family move in with their former chauffeur, played by Gourmet’s veteran chef Choi Bool-am. The ex-chauffeur now runs an auto center with his son (Chun Ho-jin of Job Well Done), who is married to Song Ok-sook (Beethoven Virus’s nervous cellist). The two families struggle to adjust to living together, making for lots of bickering but also warm family moments and laughs. Pretty solid cast, I think. Aside from those above-named actors, also cast are Choi Jung-yoon (Bad Couple, Romance Hunter) and Kang Seok-woo (You’re My Destiny, Pure 19). The drama held its first shoots on September 1 in Seoul at Seoil University. Smile is written and directed by the pair behind last year’s hit romantic comedy The Last Scandal of My Life, and will follow Style on weekends, beginning September 26. Also, I haven't seen an official thread for Smile so I'm guessing there hasn't been a press conference/prayer ceremony held yet? Anyone know anything about that? OMG, that is awesome. Min Jung finally are filming her new serie. I was starting to doubt it was filming. Great, I like the story!! she is so pretty and gorgeous. somehow she reminds me of song ji hyo, another great actress. I am really anticipating her next drama Smile, yipeeee. ^haha both are among my favorite actresses. I can't wait to see the cast together. promotional teasers for LMJ's upcoming drama Smile! does anyone know if JKH's character is related to Choi Bul Am's? are LMJ and JKH gonna live together after her family loses all their wealth? is that how their love relationship begins? is JKH gonna help become a "normal" person? Yes finally pics. Gosh I can't wait to see this. I heard it will start after STYLE, so fast! anyway, I think she live with the guy that is behind her? sorry still new with the characters name besides Min Jung. He is a hottie from Time between wolf and dog. She look beautiful with the pink dress, expecting more pretty pics! Any new update on Smile? I wish there is more news and pics. I think we can post a thread for this now that cast is out and pics, plus it replaces Style we know the time slot and kbs. soompi thread for her new upcoming SBS drama "Smile"